Delicious creams and wonderful ointments to combat itching, rash or a tired skin: CBD's beneficial properties are excellent for natural beauty. Body care is incredibly important. After all, you only have one body. At the Dutch-Headshop we would like to help you with our quality products. With high-quality ointments and creams, we can offer help for almost any type of desire of complaint concerning the body. It is of course important to know how, and to what extent you can use the products for optimal body care. All products in our product range can be used on a daily basis. Most products can even be applied to the skin at several moments during the day. Of course this also depends on your own preference. Probably, in case of severe complaints, the desire to use a product is bigger when comparing it to less severe complaints. The effect of each product is different. The main purpose of most products is, however, to improve or restore the irritated, sensitive and dry skin. What counts is that you can enjoy again a smooth and even skin. Of course there are specific complaints that can be treated with our products. Diseases such as eczema, psoriasis, diaper rash and hemorrhoids can all be alleviated with one or several body care products. There are many kinds of products to properly take care of your body. Each person has its own wishes or complaints and therefore it is important you choose the right product. Our products have a number of benefits that make them unique. All body care products are 100% natural. The products do not stain and won't color your clothing. The products' nutrients are all beneficial to your skin. The substances are not harmful and only have positive effects on your skin. All products can be used daily. All body care products are suitable for any type of skin. And, not unimportant, all products are for sale at an affordable price. Many body care products also contain CBD. CBD provides beneficial effects to the body and offers a solution to a variety of complaints. Rest assured, it does not contain psychoactive substances. CBD only has a beneficial effect on the health. Many products are suitable for use for a variety of body parts, but some products are specifically designed for a particular part of the body. There is for example lip balm, shampoo, foot cream and facial cleaner, all intended for a specific part of the body. The hemp seed oil contained in almost all body care products is a source of vitamins, minerals and other beneficial nutrients. These nutrients are very suitable for treating the skin. The hemp seed oil contains plentiful important oils, omega-3 and omega-6 fatty acids that are beneficial to skin and hair. The essential fatty acid profile of hemp seed oil shows strong similarities with the skin and helps to protect against the influences of weather and diseases. With a wide range of body care products, there of course different brands. Listed below are all ointment, cream and oil brands. 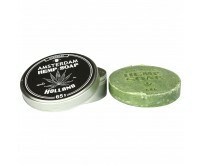 Order Dutch Headshop's body care right away, easily and quickly. Ordered today, sent today!